One of the more exciting trends at last year's Toronto Film Festival was the revival of meditative Russian cinema. True, Aleksandr Sokurov has been mining that vein for years, but his efforts sometimes even put cinephiles to sleep. A much more accessible movie, opening this weekend at the Music Box theater, is The Return, directed by Andrey Zvyagintsev. It concerns the mysterious return of a father long thought dead. His two sons (on the verge of adolescence) are both thrilled by and wary of this unexpected presence in their lives. When the father decides to take his boys on a journey to a deserted island, the relationships change even more. As you might expect, one boy takes to the father more than the other and, interestingly, the father doesn't do anything to reach out to his alienated son. Instead, his gruff demeanor hints at something dangerous, something ominous. That reaches a pinnacle when the three reach the island and the father goes searching for some long-lost treasure. The boys, no longer confident of their father's best interests, must decide what to do. Though the plot is both simple and opaque, The Return's cinematography is startling and vivid. Using the massive Russian landscape as a base, Zvyagintsev and his cinematographer Mikhail Kritchman create compositions of wondrous beauty that highlight the mythic quality of the film's characters as well as their temporality. The opening scene is a perfect example. 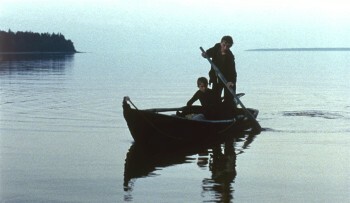 A group of boys is taking turns jumping off a high platform, and the film silhouettes them against the sky and sea. They're only boys, we're reminded, and yet they stand for some timeless evocation of youth--innocence on the cusp of understanding, faith leaping out into the void. You don't have to be a theologian to see The Return in allegorical terms. Indeed, Zvyagintsev has invited such an approach in interviews. But whether the father functions as God or Jesus or some mythological figure will depend on your reading of the film, as The Return refuses to offer any easy answers. And if you choose to see it as an Oedipal tale of sons doing battle with their father, the movie supports that interpretation as well. In any event, it's a movie that rewards careful attention. I highly recommend it.